If all politics are local, as Tip O’Neill said, that only means that politics that appear to be local, at times are not. 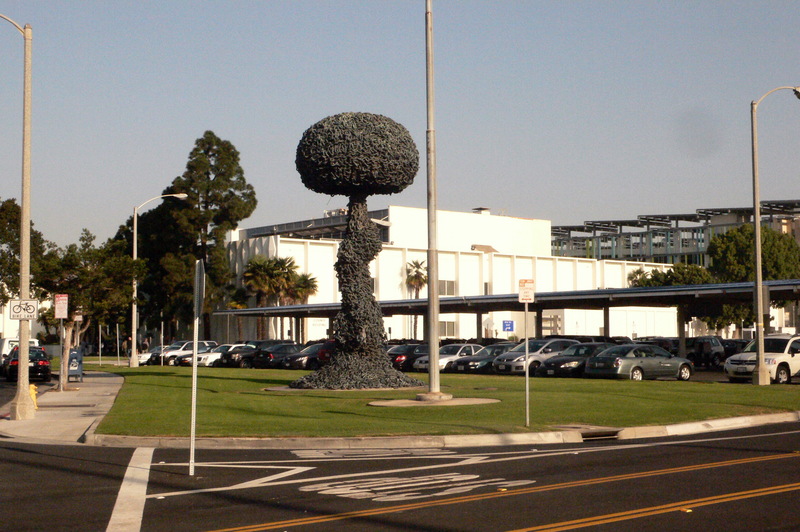 Take the controversy over what to do with Paul Conrad’s Chain Reaction, a sculpture that has stood in a triangle of grass in Santa Monica’s Civic Center, wedged between a parking lot and a drive-by stretch of Main Street, for more than 20 years. Chain Reaction before the fence went up. About two years ago a City staffer saw children playing on the sculpture, became alarmed, and all of a sudden — even though an engineer’s report later determined that the sculpture was in no imminent danger of falling down — City staff was saying that Chain Reaction had to go unless hundreds of thousands of dollars could be raised — privately — to restore it. In the aftermath, the Landmarks Commission declared the sculpture to be a historic landmark, while the Arts Commission voted not to spend public money saving it. The City Council told pro-sculpture partisans to raise the money. About $40,000 has been raised — a good showing for a campaign like this when no one knows just how much is truly needed, but not what the City has required. City Council will take up the future of Chain Reaction in February. The face-off between the Arts and Landmarks Commissions is the key to understanding why it’s important to preserve Chain Reaction, and why this dispute over a local monument implicates broader issues, and what the historic meaning of it includes. From the start, namely 22 years ago when Conrad offered the sculpture to the City, Chain Reaction was controversial because it pitted political activists, who loved how the chains metaphor communicated visually the tyranny of nuclear weapons, against some members of the arts community who variously thought that the metaphor was too obvious to be good art, or that the sculpture was plain ugly. While appreciation of a given work of art, or even how one defines art, has subjective, “eye-of-the-beholder,” aspects, the history of art is more objective, and the dispute between political people and arts people reflects certain aspects of the history of art in the 20th century. Up until the emergence a century ago of modernism in general and abstraction in art in particular, it was taken for granted that art would, could or might reflect social, political, religious or other cultural contexts, ideas, and mores, as much as the artist’s inner, and art’s formal, dialogues. But even in the context of modernism, at least through the ’30s and ’40s, many artists (think Mexican muralists) worked in an explicitly political manner. Chain Reaction, and the disputes about its creation (and now preservation), arose from the sundering of mainstream art from social engagement, and the existence of Chain Reaction is important tangible evidence of this historic moment. Paul Conrad was a Pulitzer Prize winning political cartoonist, but he was an outsider artist. When critics of the sculpture criticize its message as being simplistic one might ask them what they think about the recent unearthing and conservation of Siqueiros’ América Tropical. Was depicting “a Mexican Indian, crucified on a double cross beneath an American eagle, with two sharpshooters taking aim at the eagle from a nearby rooftop” (as the Getty describes the work) too obvious? The Landmarks Commission has done an exceptional job in documenting its reasons for declaring Chain Reaction a Santa Monica landmark, and I support all the commission’s reasons and reasoning. I want only to add that to me the importance of the sculpture transcends local history and heritage. It’s a case of local politics being not all local. This entry was posted in Uncategorized and tagged abstract art, Chain Reaction, Paul Conrad, politics of art, Santa Monica Chain Reaction by Frank Gruber. Bookmark the permalink.